This heavily illustrated, self-teaching guide to ASL--American Sign Language--is useful both for the deaf and for those men and women who teach or work among deaf people. 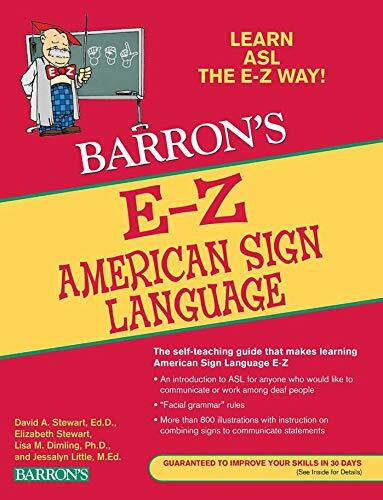 E-Z American Sign Language presents ASL's 10 key grammatical rules and emphasizes the use of "facial grammar" as an important supplement to manual signing. Most of the book's content takes the form of a presentation of more than 800 captioned line drawings that illustrate signs for their equivalent words and then show how to combine signs in order to communicate detailed statements. Barron's E-Z Series books are updated, and re-formatted editions of Barron's older and perennially popular Easy Way books. Titles in the new E-Z Series feature extensive two-color treatment, a fresh, modern typeface, and more graphic material than ever. All are self-teaching manuals that cover a wide variety of practical and academic subjects, written on levels that range from senior high school to college-101 standards.